* Illuminum is a British niche house that is probably best known for White Gardenia Petals, which was worn by Kate Middleton for her royal wedding. 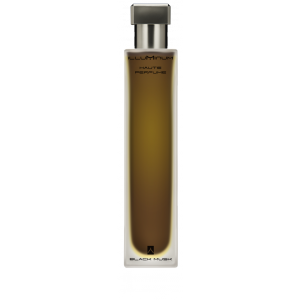 * Black Musk starts with a mix of balsams and tonka with strong projection. * Illuminum makes two lines: Vaporizor scents act as an intro to the world of niche fragrance aimed at the mainstream market, while the Haute Perfume line are at a concentration of 30% and are intense, powerful, and luxurious. * The balsams are joined by a clean patchouli and an almost chocolate-y leather. * The Illuminum Lounge in London on Dover Street offers a multi-sensory experience in fragrance where you can not only smell but taste, see, and feel it as well. It offers monthly classes in perfume appreciation/making as well. * When I wear Black Musk, it lasts more than two days on my skin, with the musk base notes lasting through two showers. Summary: Think of Black Musk as a pleasant hangover. Spray it on in the evening before you go out. When you wake up, you (and those close to you) will still smell a chocolate-y, leathery musk. A morning shower will clean your body, but the scent will persist throughout the next day, reminding you of the fun of the previous evening. With this being my first experience with the Illuminum line, I anxiously await testing more of their Haute Perfume line. I can’t wait to wear my sample. It smells great on you! “A pleasant hangover” — I like it. Your description intrigues, but having previously experienced something of a hangover from Boadicea the Victorious scents, I’m hesitant on this one. Suspect this perfumer’s hand is simply too heavy for my wimpy blood. The Haute line is powerful and very niche feeling – while the vaporiser line is a bit lighter. It might not be the fragrance you wear every day – but you should definitely locate a sample when it comes to the US and test it. It ranks up there with the strength of Black Orchid and Black Afgano to give you an idea. The more I wear it, the more I am convinced that I am going to buy a full bottle when I go to London this year. And at 199 pounds(~315 dollars) – thats saying a lot.